The Nigeria Premier League 2012 is about a month old and the start has been very interesting, especially since several young, unknown players have gotten rave reviews. In this post, I will make some observations from the first five rounds of the league. Abubakar Bukola Saraki FC, fondly referred to as ABS FC, was known as Bukola Babes FC in the Nigeria Premier League 2010-2011. ABS FC is currently rock-bottom in the league after a terrible start with only one point in five matches. Top strikers Abdulrahman Bashir and Akeem Audu has yet to score but Andrew Abalogu, the new signing from Abia Warriors FC, seems promising. Defensive midfielder Ter’ade Ichull Lordson and Ibrahim Abdullahi, both new signing from the Kwara Football Academy, are already important members of the first team. I can also confirm that attacking midfielder Christian Ofili, formerly of Dolphins FC and the Nigeria B national football team, has joined ABS FC. The newly promoted club has done well so far, partly because of some smart signings. Akwa United FC has only conceded three goals in five matches and new goalkeeper Olufemi Thomas (born 05.08.1989) has been impressive since joining from Ocean Boys FC. Thomas is arguably on the Top 5 list of goalkeepers in the Nigeria Premier League. Solomon Jefferson (defensive midfielder) and Nura Nakargo (central defender) won promotion with Wikki Tourists FC but decided to join their rivals Akwa United FC for the Nigeria Premier Leauge 2012. The performances of Jefferson have already earned him a place in the squad of the Nigeria B national football team. Nakargo was team captain at Wikki Tourists FC and as far as I know, he has been forming a strong partnership with Monday Osagie (born 31.12.1989) in the center of the defence. Akwa United FC has signed two experienced attackers from Sunshine Stars FC to boost the attack, namely Ibrahim Abubakar Babale (born 22.04.1984) and Dauda Alilu Eboh (born 25.01.1983). Babale was injury plagued last season and failed to score any league goals. On his day, Babale is one of the most poisonous strikers in the Nigeria Premier League and he will be hoping to get his career back on track. Ubong Ekpai and Ini Akpan, the latter with two league goals to his name already, are two interesting strikers with less experience than Babale and Eboh but plenty of talent. I think Dolphins FC looks very strong this season. The experienced goalkeepers Sunday Rotimi (born 08.03.1980) and Austin Brown (born 20.04.1983), signed from Heartland FC, fights for the number one shirt, with Rotimi leading the race. Left-back Kenneth Anyanwu (born 01.07.1985) is a great signing from Enyimba FC while Sylvanus Ebiaku (born 03.03.1984), formerly of Shooting Stars FC, provides cover at right-back. However, Kennedy Chinwo (born 29.12.1985) and Victor Babayaro (born 27.08.1983) could very well become the preferred full-backs. Abdulwasiu Showemimo (born 10.10.1988), a big-name signing from Kano Pillars FC, fights against Victor Ezuruike and Austin Festus (born 31.01.1989) for the places in the central defence. Hassan Hussein and Isiaka Olawale (born 11.11.1983), both central midfielders, are great signings from JUTH FC and Kwara United FC respectively. Emem Eduok (born 31.08.1991) (https://westafricanfootball.com/2012/01/28/emem-eduok/ ) and Johnson Olewezi (born 20.12.1983) are two of the most feared wingers in the league. As I predicted in my post from 04.11.2011 (https://westafricanfootball.com/2011/11/04/adamu-mohammed/), Adamu Mohammed is going somewhere. The strong striker left Gombe United FC for the more ambitious Dolphins FC before the current season and scored on his official debut. Ifeanyi Egwim, another player I have previously presented (https://westafricanfootball.com/2011/07/16/ifeanyi-egwim/), is another new signing who I expect to feature regularly for the champions. Enyimba FC has an almost completely new team, which is not neseccarily a bad thing. Personally, I think the top club looks rejuvenated and very interesting. 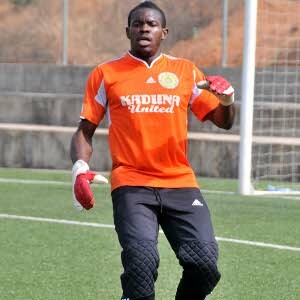 Goalkeepers Richard Ochayi and Chinedu Agwu both join from Kaduna United FC and Ochayi seems to be preferred. They have been joined by their former teammates Linus Adams (https://westafricanfootball.com/2012/01/04/linus-adams/), a central defender, and Sani Aruwa (born 24.04.1987), an attacking midfielder. The picture is of Ochayi and is taken from SuperSport. Defenders Semiu Lladi and Cletus Promise James (born 14.12.1989) from Bukola Babes FC will push established players like Emmanuel Anyanwu (born 15.11.1991), Mackson Ojobo, Samuel Tswanya (born 19.07.1989) and Chinedu Udoji (born 22.12.1989). The signing of John Nnam (born 02.12.1984), the experienced right-back / right-winger from Rangers International FC, could prove to be a stroke of genius. In January, I wrote about Nzube Anaezemba who was a key player when Rising Stars FC won promotion. The petit and skillful left-winger decided to join Enyimba FC before the season and has been an instant success. Attacking midfielder Uche Agbo (born 1991) has joined from JUTH FC. Both Anaezemba and Agbo have already scored their first league goal in the blue shirt of Enyimba FC. However, the most dangerous player at the club is currently team captain Josiah Maduabuchi (born 16.05.1989). The attacking midfielder / right-winger has already scored four league goals. Eneji Otekpa (born 02.02.1989) is balancing the midfield with style. Obinna Eleje is an interesting newcomer up front, signed from second level side FC Abuja. He will face competition from the powerful striker Ismaila Gata, who featured for both Bukola Babes FC and Kwara United FC during the Nigeria Premier League 2010-2011, and Moshood Kasali, the joint top scorer for JUTH FC last season with five league goals. Nevertheless, I expect Ifeanyi Ede (born 05.12.1990) and Uche Kalu (born 16.05.1986) to be preferred and lead the strikeforce of the club.